Our group was joined by Dr Bongkot Ngamsom as a post-doc who will be working on an industrially funded project. She will be involved in the development of novel formulations for delivery of bioactives. We welcome her in our research team and wish her a successful start of the project. Paunov research group has just received two placement students from ÉCOLE SUPÉRIEURE DE CHIMIE ORGANIQUE ET MINÉRALE (ESCOM). ESCOM is a French grande école for chemical engineering located in Compiègne, France. Margot Chaudy will be working on a novel method for extraction of nitrogen oxides from polluted air under the supervision of Prof Paunov. Nicolas Cortignon will work on a project targeting blood cancers using bioimprints under the supervision of Dr Madden and Prof Paunov. We welcome Margot and Nicolas as a part of our research team this summer as wish them success in their projects. Prof Paunov and Dr Horozov have just published a new editorial in the magazine BAKINGEUROPE which elaborates on use of one of their new inventions – a highly melt resistant food-grade hydrogel in the development of less caloric bakery products. Baking Europe is a very popular magazine which is read in over 40 countries across the world. Congratulations to Jevan Medlock who defended successfully his PhD thesis. Here is a photo of the happy PhD candidate after the viva. Jevan has been a member of Prof Paunov’s research group for more than 4 years. His PhD thesis was entitled “BIOIMPRINTING TECHNOLOGIES FOR REMOVAL OF MYELOBLASTS FROM PERIPHERAL BLOOD”. Jevan was jointly supervised by Prof Paunov and Dr Leigh Madden. He did a multidisciplinary and dynamic project aimed to capture size and shape information from blood cancer cells into polymeric imprints. Bioimprints yield cavities will a complementary morphology to template cells allowing selective rebinding. Dr Jevan Medlock is currently working as a research associate at the Birmingham Woman’s and Children’s NHS Foundation Trust. We wish him all the best in his future career! Professor Paunov has just been granted the status of a Fellow of the Royal Society of Chemistry (FRSC). Achieving Fellow status in the chemical profession denotes to the wider community a high level of accomplishment as a professional chemist. Fellows of the Royal Society of Chemistry (UK) are recognized for their outstanding contribution to the advancement of the chemical sciences and to the advancement of the chemical sciences as a profession. Prof Paunov has published extensively in the RSC journals and has build strong international recognition for his interdisciplinary work in materials science, colloids and bio-interfaces. Sebastien Dominici will be working on a tissue engineering project on preparation of model skin grafts under the supervision of Prof Paunov and Dr Madden. Patricia Sinnappu will work on novel type of formulations of functionalised nanoparticles for anti-fungal applications. We welcome Sebastien and Patricia as a part of our research team this summer as wish them success in their projects. Paunov research group received four placement students from Ecole Nationale Superieure de Chimie de Rennes (E.N.S.C.R. ), a leading Chemical Engineering School in Rennes, France. They all arrived at the University of Hull at the end of April 2018 to undertake 4 months research projects in our interdisciplinary group at the School of Mathematics and Physical Sciences as a part of her Masters degree in Chemistry and Engineering. Anna Folberth will be studying the bio-luminescence from bacteria and fungal organisms. Laurine Raimond will be involved in a project on developing formulations of antimicrobial nanocarriers in collaboration with Dr Horozov. Perrine Remaud and Marie Pelle will be involved in projects on bioimprinting of blood cancer and pancreatic cancer in collaboration with Dr Leigh Madden at the School of Life Sciences. We wish them all a successful start. Congratulations to Saba Al-Obaidy who successfully passed her PhD viva on 21 March 2018 with recommendations for only minor corrections. Saba has been a member of Prof Paunov’s research group for more than 4 years. Her PhD thesis was entitled “Nanocarrier-formulated antimicrobials and microfluidics-based screening assays”. Saba was jointly supervised by Prof Paunov and Prof Greenway. During her PhD in our research group, Saba worked on novel antimicrobial nanoparticles and showed that they amplify the effect of a variety of antimicrobials. She also demonstrated the role of the different parts of the nanocarrier on the overall antimicrobial efficiency. Saba’s PhD studies ware funded by a scholarship provided by the Ministry of Higher Education of the Republic of Iraq. We celebrated her success with a small party in our School with all supervisors and examiners present, along with Saba’s friends and family. Dr Saba Al-Obaidy will soon be moving back to the University of Babylon to continue her carrier as an academic. On behalf of all members of Paunov’s research group we wish her all the best in her career ! We welcome Sevde Celik, who joined our research group at the School of Mathematics and Physical Sciences at the University of Hull for a research placement. Sevde is currently a 5th year undergraduate student from URCA (Université de Reims Champagne-Ardenne, France), where she is studying for a Master Biologie-Santé-Qualité (Biology-Health-Quality). URCA is a French university, in the Academy of Reims, France. Sevde started her 6 months research project in our group as a part of her URSA Masters degree course. Her study is funded by CROUS de Reims scholarship. She will be developing artificial skin grafts by using cell spheroids under the supervision of Prof Paunov (Chemistry) and Dr Madden (Life Sciences). Our research group just published a new article on advanced soaps in Materials Chemistry Frontiers, 2018, ASAP article, DOI: 10.1039/c7qm00556c. The study was funded by EPSRC and Unilever. We designed novel soap-hydrogel bead composites which can release actives when pressed. The reduced cost of the smaller amount of soap base required for these materials combined with the possibility to encapsulate actives in the hydrogel beads content and the control of their release would make these composites appealing in personal care products. We envisage that these ‘‘smart’’ soap–hydrogel beads composites could also find application for more sustainable solution within the hotel industry, where millions of partially used soap bars are discarded on a daily basis. Read more on the journal web-site. We have just landed another paper on capillary suspensions of calcium carbonate particles in polar media (water or glycerol) by using in-situ particle hydrophobization through the secondary oil phase (see Dunstan et al., Langmuir, 34 (2018) 442−452.). Capillary suspensions formulated by this method have very different rheology and structuring compared with the ones with uniformly pre-hydrophobized particles. We studied the effects of the particle size and concentration on the viscosity of the capillary suspensions obtained this way. We also determined the minimal particle and secondary liquid phase concentration which yield capillary suspensions for different particle sizes. We did this for both water-based and glycerol based capillary suspensions and three different oils as secondary liquid phase and discussed the results in terms of the particle contact angle and the o/w tension. Read more on the journal web-site. We have just published a land mark article on thermally responsive capillary suspensions (see Das et al., ACS Applied Materials and Interfaces, 9 (2017) 44152–44160). Our idea is based on using oil-based suspensions of solid particles with a secondary liquid phase of a solution of a hydrogel-forming polymer. The gelling behavior of the hydrogel-forming polymer in the aqueous phase bridging the solid particles controls the rheology of the whole capillary suspension. We demonstrate capillary suspensions with completely opposite responses to temperature based on agar and methyl cellulose. Read more on our web-site. Congratulations to Ben Thompson who successfully passed his PhD viva on 1 December 2017 with recommendations for only minor corrections. What a difference 2 hours can make! We will leave it to you to guess which photo of him was taken before and which one after the PhD viva. Ben has been a member of Prof Paunov’s research group for more than 4 years. His PhD thesis was entitled “HIERARCHICALLY STRUCTURED COMPOSITES AND POROUS MATERIALS”. Ben was jointly supervised by Prof Paunov and Dr Horozov. During his PhD studies, Ben developed novel ultra melt-resistant hydrogels and showed that they can have a variety of applications for fabrication of innovative hierarchically composite materials. He also worked on hydrogel templating and viscous trapping techniques for making similar hierarchically porous materials and demonstrated the applications of these technologies in foods, home and personal care products, as well as some building materials. Ben’s PhD was funded by the an Industrial CASE award from EPSRC and Unilever R&D Vlaardingen. Dr Benjamin Thompson will soon be moving to the University of Maryland to do a post-doc in the Dept. of Chemical & Biomolecular Engineering under the supervision of Prof. Srinivasa Raghavan. We wish him all the best in his future career! We have just published a simple and generic technique for high throughput generation of tissue spheroids (see Materials Horizons, 4 (2017) 1196-1200). Our idea is based on encapsulation of dispersed adherent cells in a water-in-water emulsion stabilised by protein particles. Emulsion is formed from a cell suspension in an aqueous solution of dextran (DEX), which is dispersed in an aqueous solution of polyethylene oxide (PEO) containing protein particles. The cells are trapped in the DEX drops of a stable DEX/PEO emulsion which they prefer compared with the continuous PEO phase. Further adding of more concentrated PEO phase shrinks the DEX drops and compresses the adherent cells into tissue spheroids which are isolated by breaking the emulsion by dilution with a culture media. We envisage the application of this cheap and scalable technique for rapid preparation of similarly sized spheroids of adherent cells for bioinks for 3D organ bioprinting applications and potentially for tumour models. Read the paper on the web-site of the RSC journal Materials Horizons. We welcome our new group member Paul Weldrick who joined Paunov Research Group at the University of Hull in October 2017. Paul has received a Biology degree in 2017 from the University of Hull. Paul Weldrick PhD project involves “Nanocarrier-mediated delivery of antimicrobials to chronic wounds” . This PhD project is a part of a cluster of 7 fully-funded University of Hull studentships: “Advanced Wound Care: From Novel Therapies to Clinical Trials”. Paul will be co-supervised by Prof Paunov (Chemistry) with his main supervisor being Dr Matthew Hardman (Life Sciences). Warm welcome to our new PhD student Ben Filby who joined Paunov Research Group at the University of Hull in September 2017. Ben received his MChem degree in Chemistry in 2017 from the Department of Chemistry of the University of Hull. Ben Filby’s PhD project involves “Monitoring & manipulating wound microbiota via cell shape recognition“. His PhD project is a part of a cluster of 7 fully-funded University of Hull studentships: “Advanced Wound Care: From Novel Therapies to Clinical Trials”. Ben will be supervised by Prof Paunov (Chemistry) with co-supervisors, Prof Pamme (Chemistry) and Dr Hardman (Biology). We have just published a new paper in J. Materials Chemistry B where we report a novel surface functionalised nanocarrier for berberine by using polyacrylic acid based nanogel particles (Carbopol Aqua SF1) coated with a cationic polyelectrolyte (PDAC) which shows a strong boost in the berberine antimicrobial action. The latter was studied on C. reinhardtii microalgae and E. coli for the berberine-loaded nanogel (BLC) coated with a cationic polyelectrolyte (PDAC-coated BLC). We demonstrated that the cationic coating of the nanogel strongly increased the antimicrobial action of berberine against both C. reinhardtii and E. coli even for very short incubation times. The increase in the antimicrobial activity was attributed to the favourable electrostatic adhesion between the cationic PDAC-coated BLC and the anionic cell membranes allowing the accumulation of BLC particles on the cell walls and the local release of concentrated berberine causing the cell death. This nanotechnology-inspired approach can be potentially applied to boost the antimicrobial action for a range of low-molecular weight antimicrobial and antialgal agents by using cationic surface-functionalised nanogel carriers. A similar strategy could also find applications for enhancing the action of topical antibiotics and antifungal agents and may be used to bypass antimicrobial resistance. Read the paper on the web-site of the RSC journal J. Mater. Chem B.
Paunov’s Research Group has just published a paper in RSC Advances where we report a binary hydrogel system made from two food grade biopolymers, agar and methylcellulose (Agar-MC) which does not require addition of salt for gelation to occur and has very unusual rheological and thermal properties. We found that the storage modulus of the Agar-MC hydrogel far exceeds those of hydrogels from the individual components. Above the melting point of agar, the storage modulus of Agar-MC hydrogel decreases but is still an elastic hydrogel with mechanical properties dominated by the MC gelation. By varying the mixing ratio of the two polymers, agar and MC, it was possible to engineer a food grade hydrogel of controlled mechanical properties and thermal response. The produced highly thermally stable hydrogel shows melt resistance which may find application in high temperature food processing and materials templating. Read more on this topic on our web-site. Prof Paunov’s CRUK Pioneer Award project team has just published a key review article in the RSC journal Chemical Society Reviews. Congrats to Jevan Medlock, Dr Anupam Das, Dr Leigh Madden and Dr David Allsup who contributed to this work. Jevan Medlock, Anupam A.K. Das, Leigh A. Madden, David J. Allsup and Vesselin N. Paunov, Cancer bioimprinting and cell shape recognition for diagnosis and targeted treatment. Chemical Society Reviews, 2017, 46, 5110-5127. The review focuses on the possible applications of bioimprinting with particular regards to cancer understanding, diagnosis and therapy. Surface imprinting allows the capture of increasingly complex motifs from polypeptides to single cell organisms and mammalian cells. Highly specific cell shape recognition can also be achieved by cell interaction with imprints that can be made into polymer matrices to mimic biological systems at a molecular level. Bioimprinting has also been used to achieve nanometre-scale resolution imaging of cancer cells. Studies of bioimprint-based drug delivery on cancer cells have been recently trialed in vitro and show that this approach can potentially improve existing chemotherapeutic approaches. Cell imprints, incorporated into biosensors can allow the limits of detection to be improved or negate the need for extensive patient sample processing. Similar cell imprinting platforms can be used for nanoscale imaging of cancer morphology, as well as to investigate topographical signalling of cancer cells in vitro. Chemical Society Reviews is the leading journal of the Royal Society of Chemistry for reviews and it currently has an impact factor of 38.618. Read the article on the Chem Soc Rev journal web-site. We welcome Lucas Thuillier, a third year undergraduate from ESCOM (France), who joined our research group at the School of Mathematics and Physical Sciences (Chemistry) at the University of Hull for a summer research placement. École Supérieure de Chimie Organique et Minérale (ESCOM) is a French grande école in Compiègne, France. Lucas arrived at Hull at the end of May 2017 to undertake 4 months research project in our group as a part of his ESCOM Masters degree course. He will be exploring the properties of emulsions stabilized by cyclodextrins. Environmentally benign nanoparticles as a safer-by-design green antimicrobial nanomaterials. Read the article on the ACIS journal web-site. Fanny Schnetz joined our research group as a placement student from Ecole Nationale Superieure de Chimie de Rennes (E.N.S.C.R. ), a leading Chemical Engineering School in Rennes, France. Fanny arrived at the University of Hull at the end of April 2017 to undertake 4 months research project in our interdisciplinary group as a part of her Masters degree in Chemistry and Engineering. She will be working on a new type of nanocarriers for antimicrobial applications. Our poster presentation entitled “Cyclodextrin Stabilised Emulsions, Cyclodextrinosomes and Cyborg Cells” (authors: Baghali Mathapa and Vesselin Paunov) was given a recognition award as a best poster at the Symposium SM8 – Advanced Polymers at the Materials Research Society Spring Meeting in Phoenix, AZ, 17-21 April 2017. MRS meetings are highly interdisciplinary and consist of more than 60 parallel symposia with 3 joint poster sessions. MRS Spring meeting this year was attended by over 10,000 participants. We welcome to our research group three visiting students from ESCOM (Chemical Engineering School in Compiegne, France). Déborah Legrand, Mimôzà Ralaivoay and Laura Floury (from left to right) arrived at the University of Hull at the end of May 2016 to undertake short research projects in our group as a part of their Masters degree in Chemistry. The trio will join the current group members in pioneering research which will help them develop their scientific skills and gain vital experience in multi-disciplinary backgrounds. Déborah will be working on a new method for preparation of cell spheroids with applications in bioprinting and tissue engineering. Mimôzà will work on a project involving cell imprinting and recognition technology. Laura will be involved in a project developing a new generation of optical brighteners. Their internships will end in September 2016, when the students will produce a detailed report upon successful completion of their projects. This placement visit is expected to be the first of many in a fruitful relationship between the Paunov Research Group at the University of Hull and ESCOM (Compiegne, France). Congratulations to Emmanuel Ubuo who successfully passed his PhD viva on 23 May 2016 with recommendation for only minor corrections. Emmanuel has been a member of Prof Paunov’s and Dr Horozov’s research groups for more than 3 years. His PhD thesis is entitled “WETTING PROPERTIES OF PROTECTIVE COATINGS BASED ON STRUCTURED SURFACES”. He was jointly supervised by Prof Paunov and Dr Horozov. Emmanuel developed important insights about wetting of structured and partially impregnated porous surfaces and has been working on the self-healing coatings for antibiofouling and corrosion inhibition applications. Emmanuel’s PhD was funded by the Nigerian Tertiary Education Trust Fund (TETFund) and Akwa Ibom State University, Nigeria where Emmanuel will continue his work as a Lecturer. Professor Vesselin Paunov and Dr Leigh Madden at the Faculty of Science and Engineering of the University of Hull and Dr David Allsup, a clinical hematologist consultant from the Queens Oncology Centre at Castle Hill Hospital, were recently granted the prestigious Pioneer Award from Cancer Research UK to work on a novel in-vitro technology for removal of malignant blood cancer cells from blood samples of acute myeloma leukaemia (AML) patients based on bioimprinting and cell shape recognition. Bioimprints are physical copies of the cell surface produced by casting the myeloblast cells with polymers and other materials. The cell shape recognition is based on the increased area of contact of target myeloblast cells with their negative replica on the bioimprinted surface. This cell shape recognition technology would potentially allow Paunov’s team to develop a device which can separate in-vitro the malignant myeloblasts from the normal white blood cells. Such cell shape sorter could deplete further the blood of AML patients from myeloblasts after chemotherapy which may potentially improve their prognosis and reduce AML relapses based on the counts of minimal residual disease. Our Hull team was one of the five awarded the Pioneer Award at this round along with other teams from the Universities of Cambridge, Oxford, Manchester and the Institute of Cancer Research – London. Read more about this on the Cancer Research UK science blog. Professor Paunov was recently praised in a highlight by the Associate Editor of Journal of Materials Chemistry B, Prof Marc in het Panhuis, for the inspiration that he got from him more than 10 years ago which opened Marc’s research to novel biomaterials produced by microorganisms. Back in 2003 Professor Paunov was working with gellan gum and developed the gel trapping technique for measuring contact angles of colloid particles at a liquid surface as well as colloidosomes with gelled cores and Janus particles. Gellan gum is a polysaccharide produced by a bacterium and it can form hydrogels at very low concentrations. A brief collaboration between Marc and Vesko at the University of Hull at this time led to a novel method for dispersing carbon nanotubes in aqueous solutions as it turned out that gellan also has stabilizing properties – you can read more about this research here. Marc has been fascinated by the properties of gellan and has been using it in his research group at the University of Wollongong, Australia, inventing different ways to formulate innovative 3D printable biomaterials and soft robotics based on hydrogels. We are all happy for Mohammed Al-Awady who successfully defended his PhD thesis and passed his viva with recommendation for only minor corrections. Mohammed has been a member of Prof Paunov’s research group for more than 4 years and his PhD thesis was entitled “Nanoparticles Mediated Toxicity and Antimicrobial Actions”. He was jointly supervised by Prof Paunov and Prof Greenway. He made a valuable contribution towards better understanding of the role of the particle size and surface charge on the nanotoxicity of titania nanoparticles. Mohammed Al-Awady will continue his work as a Lecturer at the University of Babylon. Warm welcome to our new PhD student Ahmed Al-Mamoori who joined Paunov Research Group at the University of Hull in September 2015. Ahmed’s PhD project involves using synthetic colloids as antimicrobial agents. Ahmed Al-Mamoori received his BSc in Chemistry in 2005 and MSc in Photochemistry in 2012, both from the Department of Chemistry of the University of Babylon, Iraq under the supervision of Prof. Falah H. Hussein. He also specialized at the Department of Photocatalysis and Nanotechnology, Institute of Technical Chemistry, University of Hannover, Germany with Prof. Bahnemann in 2011. Since 2012 he joined the University of Babylon as an Assistant Lecturer. Congratulations to Hamza Al-Shehri, who passed his PhD viva. Hamza was a member of Prof Paunov research group since 2011. His PhD thesis is entitled “Wettability of Anisotropic and Porous Particles Adsorbed at Fluid Interfaces”. 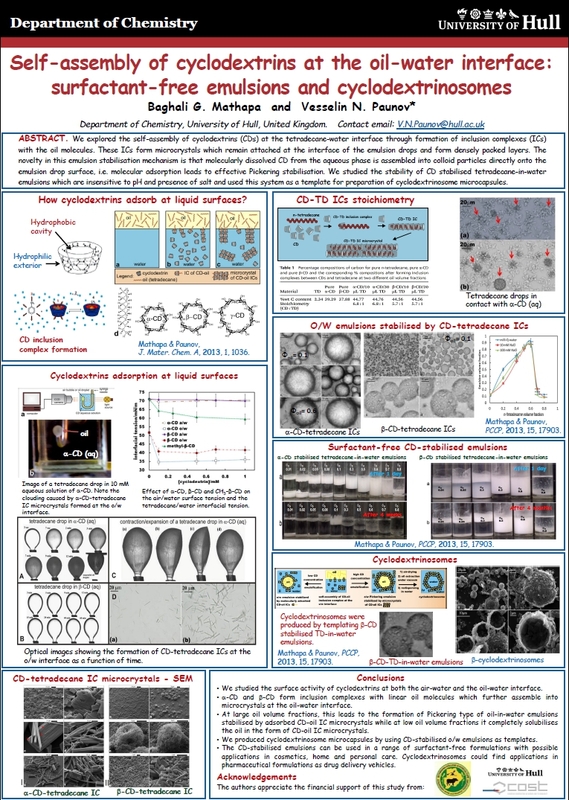 Congratulations to our alumni group member Dr Baghali Mathapa, whose poster entitled “Self-assembly of cyclodextrins at fluid interfaces: Surfactant-free emulsions, cyclodextrinosomes and cyclodextrin-functionalised living cells” won the “Best Poster” award at the European Colloid and Interface Society annual meeting Bordeaux, 6-11 September 2015. ECIS 2015 is a major meeting of the colloid scientist from Europe and around the world more than 700 participants. Dr Mathapa is currently working as a lecturer at Botswana Agricultural College after finishing his PhD in the research group of Prof. Paunov. Baghali’s poster was based on results published in his PhD thesis. Researchers have engineered nanoscale antimicrobial particles using green chemistry principles in their design, producing an environmentally benign ‘nanobullet’ which attacks dangerous bacteria and neutralizes them. An Environmentally Benign Antimicrobial Nanoparticle Based on a Silver-Infused Lignin Core – published in Nature Nanotechnology (13 July 2015). Vesselin Paunov, a Professor of Physical Chemistry and Advanced Materials at the University of Hull, was one of the researchers collaborating on this project along with international teams of Prof Velev at North Carolina State University, staff from the US Environmental Protection Agency and UCL. The researchers used these complex nanoparticles to attack E.coli which causes food poisoning, Pseudomonas aeruginosa, a common disease causing bacterium and Ralstonia, a genus of bacteria containing soil-borne pathogen species. They also targeted Staphylococcus epidermis, a bacterium that can cause harmful biofilms on plastics, like catheters, in the human body. The silver-infused lignin nanoparticles were effective against all of the bacteria. Professor Paunov was invited to present a Keynote Lecture at the European Colloid Society (ECIS) Annual Conference in Bordeaux, 6-11 September 2015. ECIS is a major meeting of the colloid scientist from Europe and around the world more than 700 participants. His talk will be on Nanotoxicity of Polyelectrolyte coated Titania Nanoparticles. Prof Vesseli n Paunov and Dr Anupam Das published an invited features article in the online journal Microbiologist (issue June 2014) of the Society of Applied Microbiology about unconventional antimicrobial agents based on colloid particles. Prof Vesselin Paunov, Dr Rawil Fakhrullin and Dr Anupam Das contributed a Chapter on “Artificial multicellular assemblies from cells interfaced with polymers and nanomaterials” in the recently published RSC book Cell Surface Engineering, edited by Prof. Yuri Lvov, Prof. Insung Choi and Dr Fakhrullin. In this chapter we review the recent developments in fabrication of multicellular assemblies from cells modified with polymers and nanomaterials. We focus on the specific properties of such “cyborg” cells which allow a variety of new methods to be used for their assembly into multicellular structures with functions rather different from those of the original cells. We discuss template and external field mediated assembly of modified cells as well as various techniques for preparation of tissue spheroids and polyelectrolyte mediated cell assemblies. Numerous applications of such cell assemblies in tissue engineering, bioprinting, biosensing and bioelectronics are outlined and commented throughout the chapter. Take a look at the contents page at the RSC web-site. The team of scientists at the University of Hull led by Professor Paunov have recently developed a new family of selective antimicrobial agents which could hold the key to fighting microbes without the use of traditional antibiotics. They discovered a way of custom-designing microparticles to recognise the shape of specific microbes and ‘de-activate’ them [1-2]. “This idea has many applications, as it allows killing microbes selectively without antibiotics. Since many superbugs have developed resistance to the available antibiotics, this technology may help us to build the next lines of defence from resistant microbial infections.” says Professor Paunov. Professor Paunov’s team have created innovative antimicrobial agents by using the microbes as templates. First, they coated the target microbes with very tiny gold particles and thin shells of silica, the same material as ordinary sand. They broke those shells in large fragments which “remember” the shape of the templated microbial cells, so when they encounter cells that match their shape they bind to them selectively. The researchers named these particles “colloid antibodies” as they recognise whole cells. When the researchers incubated colloid antibodies with a mixture of different microbes, they bind only to the original cells and bring gold particles directly on their surface. Since gold nanoparticles absorb light strongly, shining a laser on the mixture makes them heat up and kill the cells in contact. The cells that do not “fit” into the shape imprinted in the colloid antibodies remain unaffected. Their work was published in the Journal of the American Chemical Society and highlighted by the American Chemical Society and BBSRC Business magazine. We have all watched sci-fi movies with robots and cyborgs that are stronger than humans. Some of us have played computer games with special goggles that replace our environment with virtual reality. Now imagine if we can make cyborgs out of single cells. It sounds like something from the distant future but actually it is already a reality which started more than five years ago in a research lab at the University of Hull. Professor Vesselin Paunov, who leads a team of biomaterials experts in the Department of Chemistry, succeeded in turning ordinary cells like baker’s yeast into ‘cyborg cells’. The researchers managed to ‘wrap’ the cells with special polymers and very tiny particles while keeping them alive [1-4]. “The cells interact with their environment through their cell membrane,” explains Professor Paunov. A team of scientists from the University of Hull, including Prof Paunov and Prof Greenway have used magnetic nanoparticles to make magnetic yeast, whose cells can be moved around and extracted from solution with a strong magnet. They magnetised a special strain of yeast cells, then trapped them in a device called a ‘lab-on-a-chip’ – a device which shrinks the pipettes, test tubes and analysis instruments of a modern chemistry lab onto a microchip-sized wafer of plastic. The tiny lab-on-a-chip has many ingrained grooved channels, and the magnetic cells are held in these channels with a magnet . Using the lab-on-a-chip device, different liquid samples can be quickly screened for toxicity by flowing them over the cells in the channels. The yeast cells look fluorescent under a microscope when they are exposed to genotoxins as they activate their DNA-repair gene which triggers another gene that produces green fluorescent protein. García-Alonso, J. Fakhrullin, R.F., Greenway, G.M., Haswell, S.J., Hardege, J.D., Pamme, N., Shen, Z., Paunov, V.N., “Toxicity screening tool utilizing magnetic yeast and gradient mixing”, Analytical and Bioanalytical Chemistry, 400 (2011) 1009-1013.